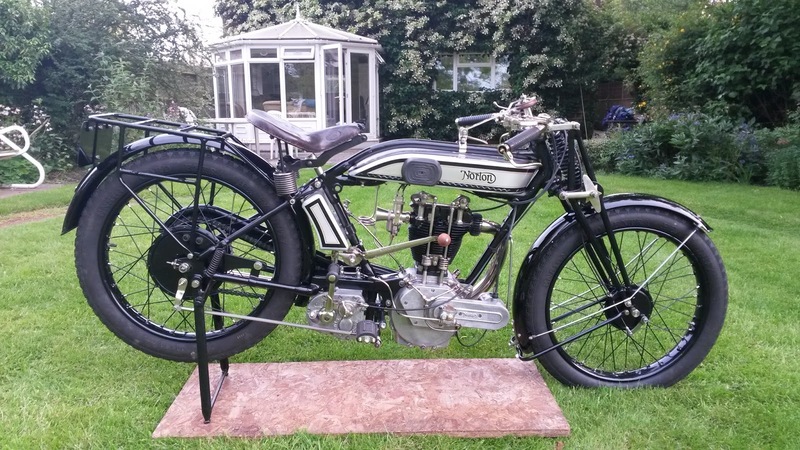 -SG- The VMCC's Founder's Day event took place over the weekend and quite the best Norton there was a 1925 Model 18, belonging to my friend Peter, who lives not that far away from Stanford Hall. I asked him for some input about the bike and how he came to have it and his comments are below. He also provided 'then and now' photos and a scan of the final log book for 1939 to 1946. 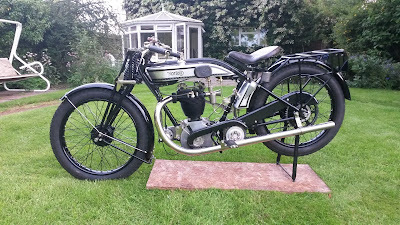 Incidentally, the bike still has its 'first gear in the middle' gear arrangement, which was fitted to many 1925 Model 18s. "Back in 2004/2005 I was working part time in Warwickshire County Council's Rights of Way Dept. when one of our contractors asked me if I'd like to buy his old motorcycle. 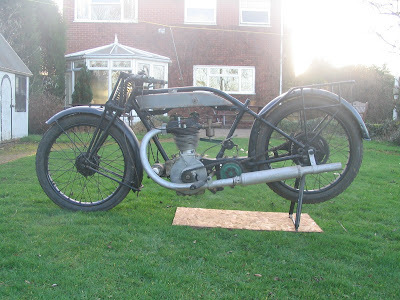 I wasn't very interested as I already had two or three old bikes but, after a long story, I ended up buying his 1925 Model 18 which was incomplete and in a very sorry state as the attached photos show. 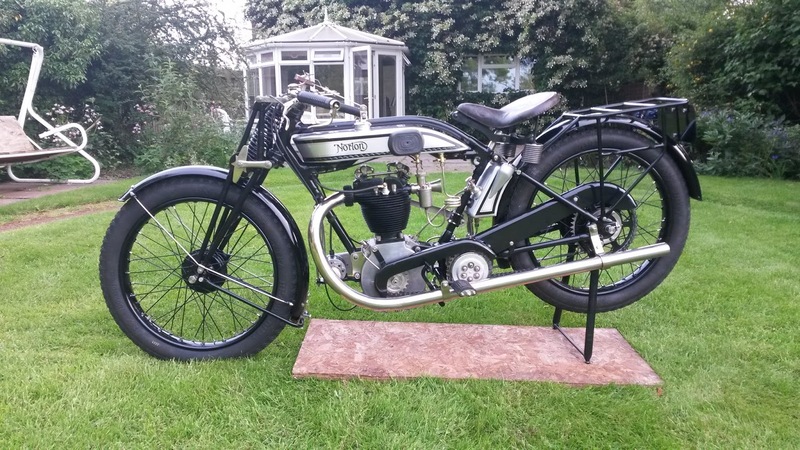 It was missing the oil tank and many smaller components and had clearly been 'ridden into the ground.' The crankcase and gearbox casing were cracked from top to bottom and from side to side. Every bearing on the bike was scrap. Previous repairs seem to have been done by the village blacksmith as everything was held together with coach bolts or bent over nails. The petrol tank had been sent away to be repainted at some point and had been put into a paint oven with the result that half the soldered joints had melted so the tank was gaping open at the front. That had happened back in about 1965 and the bike had been sitting in my contractor friend's garage untouched since then. 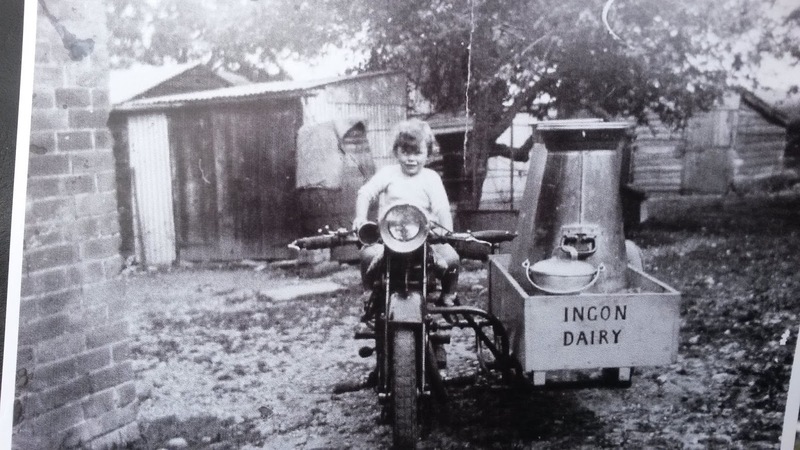 He explained that he had bought it from a chap called Oliver Hanks who had used it many years previously for delivering milk and that although Mr Hanks was deceased, his daughter Mrs Olive Terry was still living in the family farm at Snitterfield, near Stratford on Avon. From the VMCC I established that the bike was a Model 18 Norton despatched from the factory to Chapmans of Bromsgrove on 24th February 1925 and the first owner was a G W Gillcrist (I later discovered from the Electoral Rolls that he was actually George William McGillcrist, Chapmans presumably having got the surname wrong when they registered the bike with the County Council and sent the owner info. back to Nortons). Mike Worthington Williams helped me get the original registration number back. I also wrote to Mrs Terry who invited me to call round to her farm for a chat. She remembered the bike very well. Her Father, Oliver Hanks called the bike 'Julie' (no one seemed to know why) and loved the machine. She didn't know when he acquired it but he certainly had it when he got married in 1928 as she showed me a photo, now sadly lost, of her Father and Mother setting off on honeymoon on the very machine. 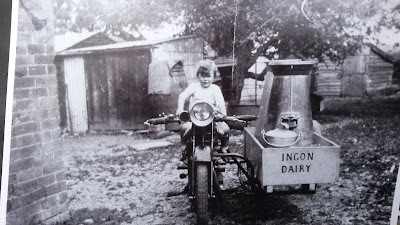 Apparently he used the bike with a sidecar to deliver milk until 1946, see photo of Olive as a small girl sitting on the bike sometime circa 1934. Mrs Terry said that he would put a double adult sidecar body on for weekends and take the family out for runs. When the Norton finally died the death in 1946 he put it in a shed on the farm but couldn't bear to part with it. In 1965, when depressed after the death of his wife, he finally sold it to my contractor friend. As I was leaving Mrs Terry, she suddenly remembered she had found something in a drawer that I might like to have, the logbook from 1939 to 1946! It's taken me over ten years of stop/start restoration to get it back on the road. I've experienced some dispiriting setbacks and have had to rectify many mistakes made by myself and others (like shattering a flywheel when forcing a 1.020 inch crankpin into a 1.00 hole!). I'm not sure if, knowing what I know now, I would undertake the exercise again but it is a wonderful machine to ride. I'd optimistically entered it in the Banbury Run each year of the last four years but it was never ready. I finally got it on the road last Summer for the VMCC Coventry Parade and, nicely run in, completed this year's Banbury Run without problems, even riding it there and back to Gaydon. It absolutely soared up Sunrising Hill. Earlier this year I took the Norton back to Mrs Terry to show her what I'd done with her Dad's bike. She was delighted and told me more about it's history as a milk float. That was when she gave me the photo of herself on the bike. 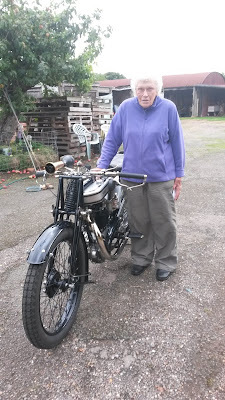 I took one of her standing by the bike, see attached, now aged 86. Behind her in the photo, to the left, is the same apple tree as it the 1930's photo, and in the background the shed where the the Norton languished from 1946 to 1965."